Crandall Public Library offers about 350,000 reading, viewing, and listening materials (including digital formats); a Children’s Library with several activity spaces; a Teen Center; computer and internet access; expansive educational, cultural, and literary programs for all ages; free meeting/program space for local non-profits; and a comfortable, accessible space in which to read, study, and socialize. The Folklife Center at Crandall Public Library offers programs, exhibits, and research related to cultural traditions of the region. NorthCountryARTS is a non-profit cultural organization providing opportunities, encouragement and promotion for artists in the North Country since 1971. It not only provides gallery opportunities but has additional shows at Crandall Public Library and other places around the region. It sponsors a spring workshop series at the Shirt Factory in Glens Falls and a Youth Visions Program among high school students. Learn... Share... Create - Experience the Arts! Located on City Park in Downtown Glens Falls the LARAC Shop is open year round, showcasing the work of over 60 regional artists. The Shop features handmade jewelry, pottery, woodwork, painting, clothing and accessories, books by regional authors, metal work, specialty foods and more. LARAC’s Lapham Gallery exhibits the work of local, regional, and national artists in seven annual exhibits. 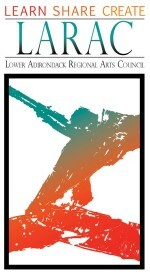 LARAC also offers workshops, arts festivals, and grants for arts and cultural projects.